Map of the town of Saratoga Springs, Saratoga Co., N.Y.
"Pathmasters Beats on Roads are designated by different colors and also by their numbers in circles"
"Fire Alarm Boxes in Village are designated by their numbers in small circles"
"All distance points on Roads are from Town Hall unless otherwise marked"
District No.2 includes all that part of the town lying east of Broadway and north of Lake Avenue and Schuylerville road. District No.3 includes all that part of the tow lysing west of Broadway and between Waring Avenue and West Congress Street. District No.4 includes all that part of the town lying east of Broadway and south of Lake Avenue and schyylerville road and north of Phila Street to Nelson Avenue and north of Union Avenue from Nelson Avenue to Fish Creek. District No. 5 includes all that part of the Town lysing west of Broadway and south of West Congress Street. District No. 6 includes all that part of the town lying east of Broadway and south of Phila Street to Nelson Avenue and south of Union Avenue from Nelson Avenue to Fish Creek. The streets which form the boundaries of these several districts are indicated by broken and dotted lines, thus -.-"
In his History of Saratoga County New York (1878), Nathanial Bartlett Sylvester described Saratoga Springs as “one of the world’s most famous watering holes, the peerless queen.” This map by Louis H. Cramer, receiver of taxes and land surveyor, and Jesse Mott, civil engineer and land surveyor – emphasizes the town’s more practical side and several different kinds of administrative divisions, drawing on knowledge gained over decades and through other collaborations; in 1876, Cramer contributed to a Saratoga County atlas published by J.B. de Beers, whose maps of Saratoga Springs contained many similar elements. The title draws attention to the “allotment lines and lots” of privately owned land. 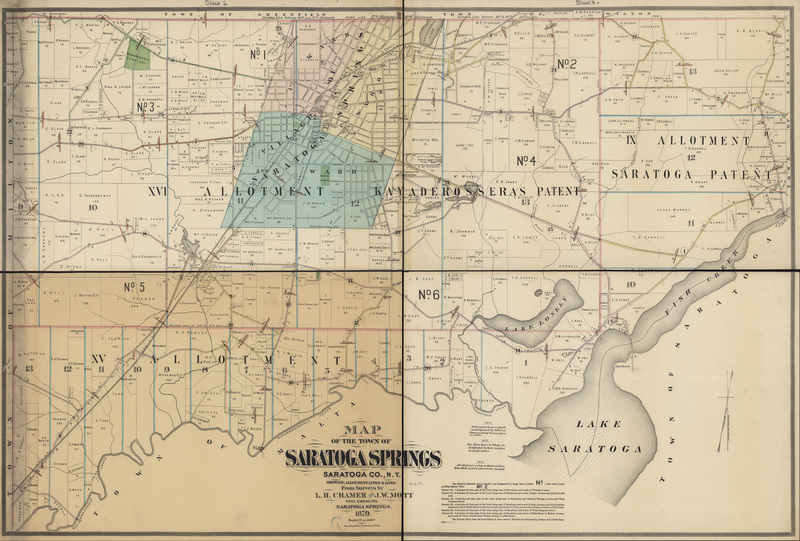 In addition to indicating private property owned by men including James M. Marvin, a director of the Saratoga Springs and Schenectady Railroad, the map’s blue boundaries show original Kayaderosseras Patent land divisions. The legends and text reveal still more: 6 election districts, the location of fire alarm boxes and even distances from the town hall to various parts of the community. The town’s recreational side does come through, however, in identifying many cultural institutions, including the famed Saratoga Race Course, built in 1864. 1 inch = 800 ft.
Cramer, Louis H. Mott, Jesse, “Map of the town of Saratoga Springs, Saratoga Co., N.Y. ,” Skidmore Saratoga Memory Project, accessed April 18, 2019, http://ssmp.skidmore.edu/document/163.